Question: To reveal the Creator’s absolute control, is that true freedom? Answer: Yes. But when it is revealed, the individual receives it as his own corrected state. That is why it is experienced not as the Creator’s control, but as your own voluntary, freewill. Question: True freedom is my right to determine what I will desire in the next moment? Answer: Yes. But this is possible only if you rise above your egoism, if you have a connection with the upper light, and if through this connection you are able to clearly ascertain what you will actually be engaged in, what you will desire in the next moment. 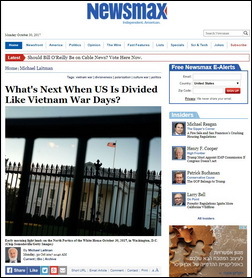 The largest portal Newsmax published my new article “What’s Next When US Is Divided Like Vietnam War Days“? It comes as no surprise to me that a majority of Americans said in a recent Washington Post poll that divisions in the U.S. are at least as big as they were during the Vietnam War, and that American politics have reached a dangerous low point. America’s socio-political climate is looking more and more like a prison yard where you have to choose your gang to get a sense of support: you’re either on the left or the right. The country is torn between liberal Democrats and conservative Republicans, and the pluralism, equality, and independence that define the American spirit have been tossed out the window. Instead of a healthy exchange of ideas, there is intimidation and smothering of free speech, and fear that if you exhibit certain political or religious affiliations, you will face verbal or physical abuse. Moreover, what’s dangerous about this divisive atmosphere is that when there is no unity in mainstream society, it appears on the fringes in forms of Nazism and fascism. Letting matters develop as they have been will result in an even more divided, contentious, and violent American society. Therefore, unity of the entire American people is imperative to keeping the American society intact. Having said that, I do hold great hope in the unity of the American people. It requires major changes in the country’s socio-economic infrastructure, most notably in education and the media, but I believe that America’s pioneering spirit can bring about a positive, creative transformation during these tough times. In terms of education, as I proposed in one of my previous columns, the establishment of basic income for participating in connection-enriching educational programs would tackle the problem of social division directly, and bring about improvements in the economy, as well as in social health and well-being. In terms of the media, instead of the constant barrage of divisive messaging, the media should aim to promote ideas and examples of the kind of unity America needs. It should primarily address America’s main problem head on: the country is divided, which negatively affects its citizens and weakens the country, and that the way to a greater America is to work on achieving nationwide unity. By coupling a more unifying media discourse with a connection-enriching educational agenda, people would learn how to accept, understand, and get along with everyone, and become influenced by a new atmosphere of mutual understanding, support, awareness and sensitivity. As a result, there would be reduced violence, crime, substance abuse and increased happiness in society. America still has a chance. By emphasizing the unity of the entire American society, the American spirit can be revived. Today’s American Dream, however, needs to revise its surge of motivation through a new vision: people of different cultures coming together to find happiness through social cohesion. If the American people don’t realize their need for unity in a positive way, then the negative versions of unity—Nazism and fascism—will increasingly close in on society from both sides. Question from Facebook: The central place in all religions is the concept of God. What does God mean in Kabbalah? Answer: God in Kabbalah means the general force of nature, except for it, nothing exists. In itself, this is an abstract concept in relation to a person, and we cannot speak about something that exists outside our perception. No one has ever felt it. This state of the Creator, which is not in relative to us when this upper force exists by itself, in no way can be perceived by us, and therefore, this force is called Atzmuto, meaning He by Himself is Himself. Everything that we attain and what is possible for us to attain are the actions of the upper force in relation to us. The wisdom of Kabbalah deals with revealing these actions in relation to a person. We call this upper force the Creator because He created man, He created all the qualities in a person, within which we feel our world and can explore through our senses the Creator Himself, the one who created us. We can explore why He created us with these qualities, with these limitations or, conversely, with these abilities, and what the Creator wants from us. Developing in this direction, we begin to attain Him, meaning the Creator. Not Atzmuto, not Him by Himself, but exactly the Creator in relation to us. In this way, we explore His actions, how He created our world and all other worlds, which is a certain system of connections between Him and us. Such a system of connections of gradually descending degrees is called worlds. This system affects us. By studying these worlds, we study the Creator, we study ourselves, we understand in what states we are in connection with Him. And we can change our behavior and our actions in accordance with this in order to raise ourselves to higher connections, to be connected directly with the Creator, literally face to face. In other words, we can see what kind of reactions our actions produce in Him and, conversely, what reactions His actions produce in us. We can reach an absolutely complete, open two-way connection. When we begin to attain this opportunity, to reveal and achieve it gradually, we naturally change our behavior in accordance with what we reveal, and we enter a completely different stage of our development where we begin to change into similarity with the Creator. At the same time, our world and we ourselves are change radically and our state becomes more and more reliable, convenient, correct, and true. Question: Who do I call God if I study Kabbalah? Answer: I call God the general force of nature. It is called Elokim, which in gematria (the numeric value of the word) is equal to Teva (Nature). The entirety of nature that I reveal, everything that affects me externally, I call the Creator, and everything that is inside of me, I call the derivatives of the Creator. This is the whole purpose of our work, study, and all sorts of actions—to make an absolute similarity between ourselves and the Creator in desires, intentions, and actions and to reach a completely harmonious connection. Just as I discover that all the qualities of the Creator are bestowal and love, so I raise myself to these qualities. All this is perceived through feelings; after all, a person is a sensory creature. The mind is given to him in order to control these feelings and form them into similarity to the Creator. We are created only for this. However, in order to come to this decision, conclusion, and action, we must go through a very long stage of historical development: inanimate, vegetative, animate, and speaking. Now we have come to the very last stage of human development. We just need to reveal the Creator and make ourselves similar to Him. Then we will be called “Man” (Adam, which means similar). Question: What is the meaning of the workshop, discussions in a circle, as a method of practical work widely used in Kabbalah? Answer: A “workshop” is a joint action of ten men or ten women who perform exercises according to the recommendations given in the Kabbalistic sources or under the guidance of a teacher, like athletes under the guidance of a coach. Only these are not physical exercises, like in sports, but internal ones based on inner efforts to connect with each other to such an extent that inside this connection the Creator will be revealed. There are many different types of workshops, but as a rule they are held as a preparation for Kabbalah lessons. During the workshop, we check connections between us, how much they correspond to the nature of the Creator, bestowal and love. Once we reach such bestowal and love for each other during the workshop, or conversely, we cannot reach them, but discover our oppositeness to each other—we move to studying. Then through the study, we demand from above the force of bestowal, the Light that returns to the source, that is, the force that exists in the Creator. This is called the study of the Torah, about which it is written, “I created the evil inclination” that separates us in the ten and “in addition to it, I created the Torah, the Light that returns to the source”. It turns out that if we study Kabbalah in the ten in order to get closer and connect with each other, then we can use the force of the Torah. During the study, we learn what it means to be connected, how spiritual objects (Partzufim) and worlds are built, what the ladder of spiritual degrees is, and how all this connects together and joins us to itself. In this case, we attract a special force to ourselves called Torah, Surrounding Light, or the Light that returns to the source, which influences us and brings us closer to each other. In this way, we build a network of connections in which we eventually reveal the special phenomena called the manifestation of the upper force, the revelation of the Creator. Torah, Deuteronomy 32:18 – 32:21: You forgot the [Mighty] Rock Who bore you; you forgot the God Who delivered you. And the Lord saw this and became angry, provoked by His sons and daughters. And He said, “I will hide My face from them. I will see what their end will be, for they are a generation of changes; they are not [recognizable] as My children whom I have reared. They have provoked My jealousy with a non-god, provoked My anger with their vanities. Thus, I will provoke their jealousy with a non-people, provoke their anger with a foolish nation. The people of Israel have to pass through these states because only from a sense of evil and the necessity to achieve good does a person begin to call out to the Creator. He understands that he is obliged to undergo this operation and agrees that the Creator will perform it on him. This is called the awareness of evil. Question: Does the Creator speak in such a way on purpose, so that a person connects to His thought? And really, look at what is happening now with our people. To what extent it is torn, separated, internally opposed to itself. There is no other people that would be so multifaceted in its negative polarity. Compared to what the Creator requires of us, there is nothing positive within us. And if there is, then this positive correlation is not with us, but with the fact that we have a spark from the Creator, from which, perhaps, the flame will kindle. We are its carriers. But this is why we are even meaner and more egoistic than all other nations. If it weren’t for this spark, we would be like the rest. But we will never be like them. Inside us there is something that has been distinguishing us from other nations throughout the millennia of our history, and there is nowhere that we can get away from it. We need to understand that we are obliged to realize in ourselves a special truth, a method: “to be a light unto nations.” That is, to show all nations the possibility of uniting, creating the correct community of people in which the Creator is revealed. Only we can do this, but we do not fulfill our role. That is why we are so hated. That is why the Torah calls us a “foolish nation” that can do good to others, but does not do it. The nations of the world instinctively understand this and rightfully hate it. Especially at a time when we have already received the land, the state, all the conditions to reveal the wisdom of Kabbalah to the whole world and bring it to people. But no one wants to listen to Kabbalists, everybody turns away from us. Question: That is why He “will hide My face”? Answer: Yes. The Creator is moving away. He is hiding behind our egoism, while right now He must reveal himself in the quality of bestowal and love over the egoistic quality. And since we do not do it, He hides even more. “Disclosing the face of the Creator” means that we see the correct management, we know how to act, and in response to our every right action, we immediately receive a good, wonderful impact of nature. This is an absolutely complete interaction! We immediately receive an answer for any action. Baal HaSulam writes about this in the article “Concealment and Disclosure of the Face of the Creator.” That is, all of nature is revealed to us as a panel on which we see everything and can take anything from it. We work with it in unison, in friendly tandem.